For years, downtown Paris, Ky has been one of my favorite places to “escape” on a Saturday afternoon. It was close enough to home, but far enough away to feel that I had been on an adventure. On my visits, I’d always made a point to stop in an antiques place on the corner of Main and 7th Street. It was one of those places that was big, dingy and dusty, and I could spend an hour or two searching and digging for antiques to my heart’s content. And, they kept a great inventory of vintage Fiestaware, my favorite! Then one day, I came to visit, and the store was gone! I was so disappointed, until…I realized the wonderful treat that’s taken its place. Ardery’s Antiques & Collectibles. Ardery’s has been located at Main and 7th for four years now (It’s hard to believe that the time has gone so quickly) in an 8,000 square foot renovated building, formerly a “J. J. Newberry” 5 & 10 cent store, from the late 1930’s . And what an asset to downtown Paris and Main Street they are. Ardery’s has been the recipient of several historic preservation and beautfication awards. Even though both Ardery’s and its predecessor both retailed antiques, there’s a world of difference between the two. Ardery’s got rid of the dust, the dinge and the feeling of a “closed in” space (even though the square footage of the store is quite ample). Now the store is bright and welcoming, and though Ardery’s has a considerable antiques inventory, it is organized and well-arranged within the space. Ardery’s offers a wide variety of items from antique furniture and home accessories (tables, chairs, bedroom suits, sofas, china cabinets and more) to glassware and china (There’s still a creamer and sugar set that I can’t get out of my head. Alas, another trip…). 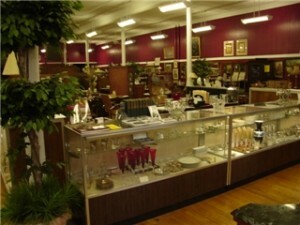 They offer cut crystal, sterling items, lighting, artwork including original oils, sculptures, porcelains and collectibles, as well as antique and vintage jewelry. In fact, at the time I visited for this review, the store had recently had in customers who had made purchases, and then returned to the store over several days to select a variety of furnishings for their home. If you’re searching for interior decorating inspiration and ideas, as well as the furnishings to bring those ideas to life, Ardery’s is the place you can do it. Their mix of inventory could easily fit a traditional décor for an established family home; an overall modern style that employs the use of antiques or vintage items as accent pieces that might be favored by newlyweds; as well as an eclectic style for a single-dweller living in an apartment or condominium. The store also has a unique feature. The piece de resistance? 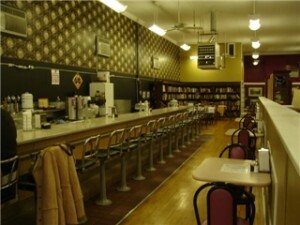 “The Fountain”, an original old-fashioned soda fountain featuring homecooked meals, sandwiches, ice creams and homemade desserts. By several accounts, you’d be hard-pressed to find a seat during a weekday lunchtime. Planning an antiques venture soon? If so, Ardery’s Antiques & Collectibles should certainly be on your list. Store hours are 10 am – 5 pm Tuesday thru Saturday. “The Fountain” hours are 11 am – 2 pm Tuesday thru Friday. What could possibly be better than shopping and a great lunch all in the same place? Take a friend and make an afternoon of it. And when you do stop in, make sure to let the folks at Ardery’s know you heard about them here! Have fun!